TELEVISION - From Reason: Anthony Bourdain: The rise of Authoritarianism across the world should concern everyone. TELEVISION - From BleedingCool: HBO is going to debut the documentary about Carrie Fisher and Debbie Reynolds on January 7th, 2016 at 8 PM ET/PT. It is entitled "Bright Lights: Starring Carrie Fisher and Debbie Reynolds." TELEVISION - From TVLine: Leslie Jordan says that NBC is ordering 10 episodes of the Emmy-winning television series, "Will & Grace." Jordan won an Emmy for playing recurring character, "Beverly Leslie." SPORTS - From YahooSports: Corporate media talking heads swore that NFL QB Colin Kaepernick was hated by his San Francisco 49er teammates because of his "Pledge of Allegiance" protests. Those same teammates just gave him the team's highest honor. POLITICS - From AlterNet: Carrie Fisher hated President "elect" Donald Trump and was not shy about it. POLITICS - From AlterNet: Conservative gun-nut columnist, M.D. Harmon, let a child play with his gun and the gun went off while junior was fondling it, killing Harmon. OSCARS - From TheGuardianUK: There is some truth to what Lee Daniels says about #OscarsSoWhite. MUSIC - From Esquire: Music legend David Crosby talks about Trump and Kanye. MUSIC - From YahooMusic: Run-DMC sues Wal-Mart and Amazon for 50 million. CELEBRITY - From YahooSports: Tennis superstar Serena Williams is engaged to marry Reddit co-founder, Alexis Ohanian. COMICS-FILM - From TheWrap: Ryan Reynolds apparently shot as scene as his character Deadpool for next year's X-Men/Wolverine movie, "Logan." From THR: Ryan Reynolds would like for there to be a Deadpool/Wolverine movie. OBIT - From People: Carrie Fisher has died at the age of 60, Tuesday, December 27, 2016. She was best known as "Princess Leia" in the "Star Wars" films. I'm numb. From THR: The actress Debbie Reynolds has died at the age of 84, Wednesday, December 28, 2016. Reynolds was the mother of actress Carrie Fisher who died at the age of 60, Tuesday, Dec. 27th, 2016. A Hollywood legend, Reynolds appeared in such classic Hollywood musicals as "Singin' in the Rain" and "The Unsinkable Molly Brown." From YahooNews: Todd Fisher talks about his mother, Debbie Reynolds, final moments. From YahooNews: Carrie Fisher could make us laugh through the pain. From BleedingCool: The comic book community reacts to the death of Carrie Fisher. OBIT - From People: The author Richard Adams has died at the age of 96, Saturday, December 24, 2016. Adams is best known as the author of the beloved classic children's novel, "Watership Down," first published in 1972. OBIT - From YahooStyle: The actor and comedian, Ricky Harris, has died at the age of 54, Monday, December 26, 2016. He was best known for his recurring roles on "Moesha" and "Everybody Hates Chris." TELEVISION - From TheGuardianUK: A&E has cancelled "Generation KKK," its eight-part doc about the hate group, after learning that producers paid nominal fees to members of the Ku Klux Klan to get them to participate. STAR WARS - From BleedingCool: Rian Johnson, who is directing Star Wars Episode 8, defends the much-maligned Star Wars prequel films. ECO - From BBCNews: Save the cheetah! BOX OFFICE - From Variety: "Rogue One" is expected to win the four-day Christmas weekend, 12/23 to 12/26/2016, with an estimated take of $96.1 million. OBIT - From YahooMusic: British singer, songwriter, producer, and pop superstar, George Michael, has died at the age of 53, Sunday, December 25, 2016. From YahooCelebrity: George Michael had a difficult life of depression, drugs, and arrests. From YahooMusic: George Michael's best musical moments. From YahooCelebrity: Celebs react to Michael's death. From YahooMusic: George Michael - a life in photos. From YahooMusic: The evolution of the genius of George Michael. From YahooMusic: What George Michael had to say about Prince one time. From RSN: The frank and uncompromising LGBT icon, George Michael. From YahooMusic: George Michael reportedly left behind an estate worth $130 million U.S. BOX OFFICE - From TheWrap: Estimates have "Rogue One" on top of the Christmas weekend box office. From Patreon: My "Rogue One" review. CHRISTMAS: From YouTube: Merry Christmas!!! and Happy Holidays!!! -- A*O*A. offers "Afraid of Americans," an electro/industrial remake of David Bowie's "I'm Afraid of Americans," a single from his 1997 album, "Earthlings." 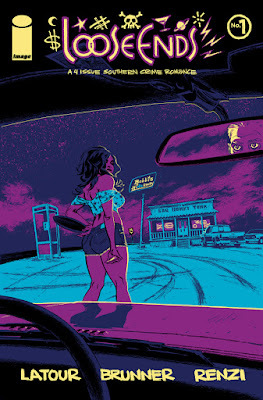 [via Warren Ellis' "Orbital Operations"] Visit them here. BLACK LIVES MATTER - From ABC: There is growing backlash over the arrest of a African-American mother in Fort Worth, Texas who called the police after her son was physically abused by a white neighbor. COMICS - From BleedingCool: DC Comics is apparently planning a summer comic book event that is centered on Batman. From YouTube: An extended look at "Riverdale," the CW's re-imagining of the world of Archie Comics. It debuts January 26th, 2017. From YouTube: First official trailer for Ridley Scott's "Alien: Covenant," which is due May 19, 2017. From YouTube: First trailer for "Despicable Me 3," due in theaters Summer 2017. From YouTube: First official teaser trailer for the long-awaited "The Lost City of Z." 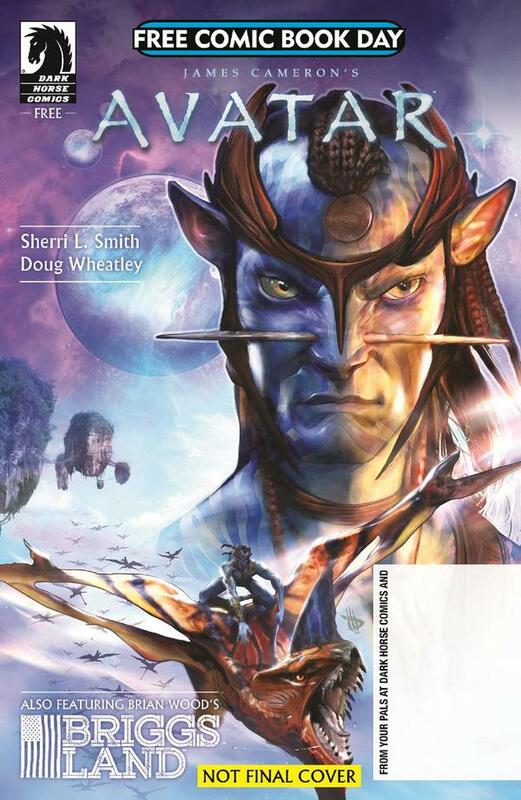 Dark Horse Comics Has "Avatar" for "2017 Free Comic Book Day"
MILWAUKIE, Ore.—Visit your local comic shop on Saturday, May 6, 2017, for Free Comic Book Day 2017! Dark Horse Comics is proud to announce our FCBD Gold Comic featuring James Cameron’s Avatar and Brian Wood’s Briggs Land! The Nevada Film Critics Society (NFCS) is apparently a society of film critics who reside in Nevada and produce film reviews for print, broadcast, radio, and online. 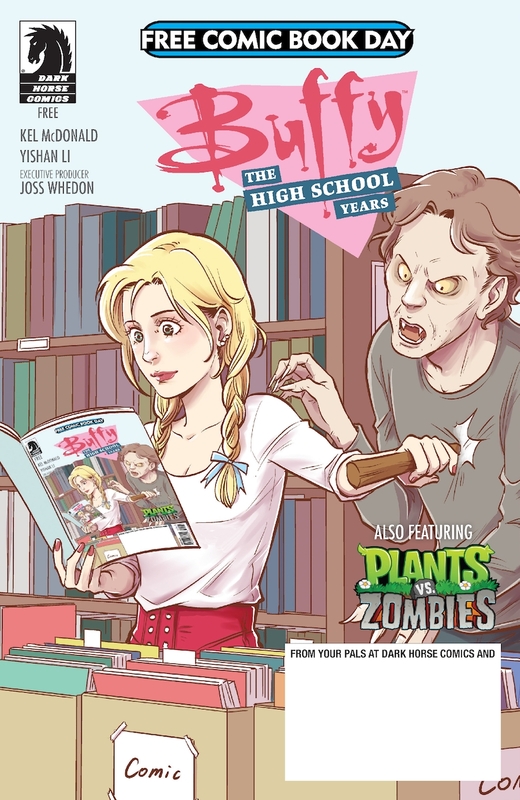 MILWAUKIE, Ore.—Dark Horse Comics is excited to feature stories from Buffy: The High School Years and Plants vs. Zombies: Unrest in the Old West™ in our all-ages issue for Free Comic Book Day on Saturday, May 6, 2017. Kel McDonald (Misfits of Avalon), Yishan Li (Buffy: The High School Years, Paradox Girl), Rod Espinosa (The Courageous Princess, Neotopia), and Tony Galvan (Gold Digger, Ghost Cop) show us that the #SlayerStruggleIsReal in a new Buffy: The High School Years story. The FCBD all-ages issue finds sixteen-year-old Buffy trying to reconcile her Slayer duties with typical teenage problems—bad luck and demon battling can really destroy a girl’s confidence. 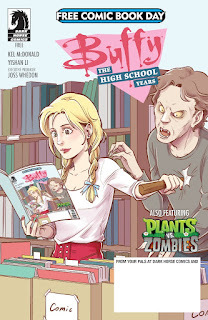 Eisner Award–winning writer Paul Tobin (Bandette, The Witcher) and Plants vs. Zombies senior artist Rachel Downing deliver another sidesplitting tale from the hit series Plants vs. Zombies! Our favorite characters take a time-traveling journey to the past, where they learn they must work together to defeat the devious Sheriff Tarnation. Free Comic Book Day is a single day when participating comic book specialty shops across North America and around the world give away comic books absolutely free to anyone who comes into their shops. Visit FreeComicBookDay.com to learn more! Recently, Dark Horse announced a Gold Free Comic Book Day offering featuring James Cameron’s Avatar and Brian Wood’s Briggs Land. Plants vs. Zombies © 2017 Electronic Arts Inc. Plants vs. Zombies and PopCap are trademarks of Electronic Arts Inc. All rights reserved. 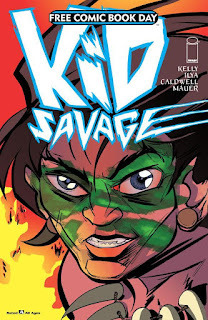 Image Comics is pleased to announce participation in Free Comic Book Day 2017 with these fun, vibrant, all-ages titles—KID SAVAGE by Joe Kelly and Ilya and I HATE IMAGE COMICS by Skottie Young. Free Comic Book Day will take place Saturday, May 6th, 2017 at participating comic book shops worldwide. I HATE IMAGE COMICS will be the Gold Level free comic book from Image Comics and KID SAVAGE will be the Silver Level free comic book. Readers can dive into the first chapter of another heartfelt adventure perfect for the whole family this Free Comic Book Day with KID SAVAGE. Enjoy this sweeping story of survival from Man of Action Entertainment (Big Hero 6, Ben 10) founder Joe Kelly—who first enchanted readers with the multiple-award winning, I KILL GIANTS—and illustrated by the lauded British cartoonist ILYA. Here readers meet the pioneering "First Family in Space" after they take a catastrophic wrong turn on their maiden voyage. When they crash on a dangerous alien planet their twenty-first century know-how is useless against the harsh environment and survival seems unlikely... Until they meet a strange ally: a mysterious orphan boy, short on temper but big on survival skills. KID SAVAGE is a wild ride through uncharted territory, and everyone is invited along for this unique journey. After putting up with 25 years of creator-owned content, Gert is turning on her own publisher in Skottie Young's I HATE IMAGE COMICS, just in time to celebrate this milestone anniversary for Free Comic Book Day. Join Gert as she steps out of the world of I HATE FAIRYLAND and sharpens her battle-axe across some of the most beloved Image titles in history. Heads will roll and limbs will be severed as Gert faces off with a cast of characters so diverse they could only have come from the superstar talent that has made Image the number one publisher of creator-owned comics for two decades and running. 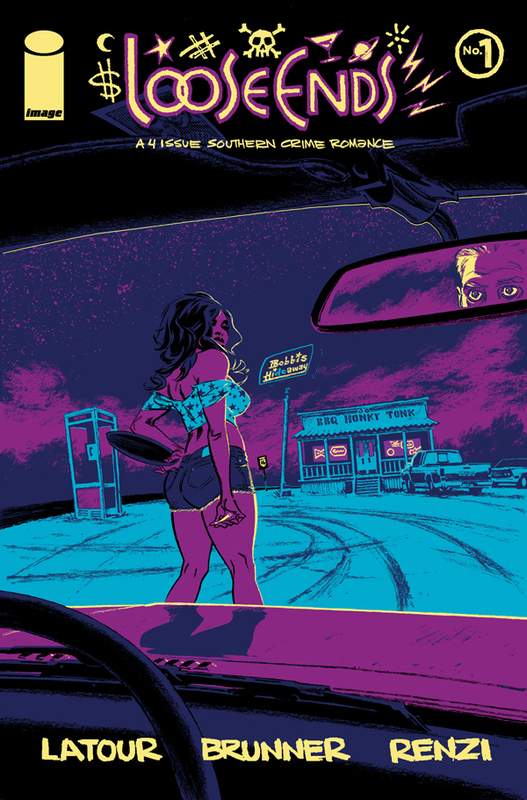 Featuring characters from THE WALKING DEAD, SAGA, YOUNGBLOOD, CHEW, THE WICKED + THE DIVINE, and many, many more—nobody is safe. Established in 2016, the Seattle Film Critics Society (SFCS) says that it is dedicated to supporting local productions and festivals, enhancing public education, awareness, and appreciation of cinema, and strengthening the bonds of critical dialogue as it pertains to the cinematic arts. The group seeks to highlight the best films produced each year–both by the major studios and independent filmmakers–and share our love of cinema with Seattle-area residents. The group is made of a robust network of film critics and reviewers in Seattle and surrounding areas of Washington State. The society is represented by members in print, radio, television and online mediums. The nominations for the 2016 SFCS Awards were announced Wednesday, December 21, 2016. The winners will be announced Thursday, January 5, 2017. From Variety: As of Tuesday, December 27, 2016, the worldwide box office for "Rogue One" is at $615 million. From BleedingCool: Carrie Fisher dies at the age of 60, Tuesday morning, December 27, 2016. From THR: Debbie Reynolds, the mother of Carrie Fisher, has died at the age of 84, Wednesday, December 28, 2016, one day after the death of her daughter. From People: "I want to be with Carrie" were Debbie Reynold's last words according to her son, Todd Fisher. From YahooStyle: Why she really hated the gold metal bikini in "Return of the Jedi." From YahooNews: Debbie Reynolds speaks about the death of her daughter, Carrie Fisher - our Princess Leia. From Variety: Fisher reportedly finished her work on Star Wars Episode 8 before she died. From TheWrap: Posted a little over an hour ago, Debbie Fisher, mother of Carrie Fisher, who suffered a heart attack about a day and a half ago, says that Carrie is in "stable condition." From Patreon: My review of "Rogue One." From Deadline: "Rogue One" soars past $200 million. From TheVerge: "Rogue One" had a different ending. From ABC7: Gareth Edwards hopes for lasting cultural impact of "Rogue One." From Polygon: Don't be afraid to talk about "Rogue One" and politics. From Variety: "Rogue One" has $155 million opening weekend. From CBR: Rebellions are built on hope. Why "Rogue One" matters now. From YahooMovies: The inspiration for the "Star Wars" logo. From Variety: $71 million in box office (North America) for "Rogue One" on Friday, Dec. 16th. From Variety: "Rogue One" debuts with a massive $29 million Thursday night preview, the largest box office for a Thursday preview this year. YahooMovies: From Variety by Peter Debruge. YahooMovies - From AP by Lindsey Bahr - a dark exhilarating blast. From Variety: "Rogue One" had its world premiere Saturday night, December 10, 2016 at Pantages Theatre in Hollywood. From YahooMovies: George Lucas apparently like "Rogue One," cause he wasn't to crazy about "The Force Awakens." From YouTube: Felicity Jones, "Jyn Erso" in Rogue One, was recently on "The Tonight Show with Jimmy Fallon" showing off her martial arts moves. From CNET: There will be new and weird creatures in "Rogue One." From Variety: Advance ticket sales for "Rogue One" go on sale Monday, November 27, 2016. From YouTube: Third and final (supposedly) official "Rogue One" trailer. From YahooMovies: Spoilers in third Rogue One trailer. From Gamespot: International "Rogue One" trailer with new Darth Vader footage. From YouTube: New official trailer - released for the Olympics. From YouTube: "Rogue One: A Star Wars Story" - Celebration Reel. From ThePlaylist: New "Rogue One" poster. From ScreenRant: "Rogue One" gets an official synopsis. From YahooMovies: Jimmy Smits confirms that he will play "Bail Organa" in a cameo in "Rogue One." He originated the performance in "Attack of the Clones" and "Revenge of the Sith." SPOILER - From Vulture: Jiang Wen spoils the fate of a character... maybe. From YahooTech: Darth Vader is rumored to have a cameo in "Rogue One." From YahooMovies: First "Rogue One" trailer is here!!! From Moviesdotcom: A new trailer for "Rogue One" to drop next week. From ShadowandAct: James Earl Jones to voice Darth Vader in "Rogue One." From Collider: 16 early images from "Rogue One." From ScreenRant: More details about Darth Vader's appearance in "Rogue One." From TheWrap: Forest Whitaker's character in "Rogue One" is Saw Gerrera, a character that first appeared in the CGI-animated TV series, "Star Wars: The Clone Wars. From ScreenRant: Dave Filoni, showrunner for "Star Wars: The Clone Wars," expresses pride at the fact that Saw Gerrera will appear in Rogue One. From YahooNews: Darth Vader looms large over "Rogue One." From EntertainmentWeekly: The true and false concerning "Rogue One" reshoots rumors. From ScreenRant: The "Rogue One" reshoots rumor breakdowns. From WeGotThisCovered: Rumors say the reshoots will feature a watered-down version of Darth Vader whoopin' a Rebel squad. Rumors also suggest that director Gareth Edwards is livid about the reshoots on "Rogue One." From Wired: A week of Star Wars news, including "Rogue One" reshoots. From YahooMovies: "Rogue One" reshoots will involve veteran stunt coordinator and second unit director, Simon Crane, and also, screenwriter, Tony Gilroy, who wrote three "Jason Bourne" movies. From BleedingCool: The Rogue One reshoots are apparently to address character moments rather than the tone of the film. From YahooNews: Rumors say that Disney is not happy with "Rogue One." From YahooMovies: A book preview allows details about characters to emerge. From Collider: Mads Mikkelson reveals who is playing in "Rogue One." From YahooNews: Boba Fett might be in Rogue One? From MakingStarWars: The rumors about Forest Whitaker's character in "Rogue One" include that he might be a bounty hunter. From Esquire: Union issues could further delay Episode 8. From THR: Star Wars 8 moves from May 2017 to December 2017, which gives Rogue One more box office breathing room. From YahooTech: Rumors of Darth Vader's return for "Rogue One," and even a CGI Tarkin. From TMZ: Possible classic X-wings. From StarWarsTime: Rogue One trailer to debut on "Captain America: Civil War." From StarWarsSite: "Rogue One" page. From SlashFilm: Rumors about specific Rogue One characters and more. From Variety: "Rogue One" is the most anticipated movie of 2016, according to survey. From ScreenRant: Ben Mendelsohn talks about being in this film. From HitFix: What we know about Rogue One so far... not much really. From Wikipedia: Rogue One page. Apparently, the title is actually, "Rogue One: A Star Wars Story." From TMZ: Carrie Fisher suffers a heart attack on a plane. From YahooMovies: 10 actors who have played Darth Vader. From BleedingCool: Peter Sumner, an actor in the original Star Wars film, has died at the age of 74. He played Imperial officer, Lt. Pol Treidum. From Variety: Emilia Clarke is the female lead in the "young Han Solo" spinoff Star Wars movie. YahooNews: Darth Maul will get his first Star Wars comic book published by Marvel. He had a least a few when Dark Horse had the license to produce Star Wars comics. YahooMovies: Carrie Fisher reveals that she had an affair with Harrison Ford during the making of the original Star Wars film. Ford was 14 years older than Fisher and also married. YahooCelebrity: Harrison Ford had an interesting reaction when Carrie Fisher told him that she was going to reveal their affair. From CinemaBlend: Han Solo movie may break some rules. From ScreenRant: Rumors about Finn's recovery in Episode 8. From SlashFilm: Warwick Davis to appear in Episode VIII, as he did in VII, and as he will in "Rogue One." From YahooMovies: See rare concept art for the original "Star Wars" film. From EW: TNT and TBS will have exclusive cable broadcast rights to "Star Wars" films for some time. From Vulture: Disney CEO Bob Iger confirms a Star Wars anthology film for 2020. From CinemaBlend: Lupita Nyong'o says that her character, Maz Kanata, will be in Episode 8. From YahooNews: Adam Driver (Kylo Ren) praises director Rian Johnson on Episode 8. From FlickeringMyth: Katee Sackhoff reprising her role on "Star Wars: The Clone Wars" for "Star Wars Rebels" Season 3. From YouTube: Lucasfilm gifts this four-minute-plus VFX reel from "The Force Awakens." From YahooNews: Mark Hamill lets a spoiler slip... Luke will be back for Episode 9. From IndieWire: John Williams says that he will begin composing the score for Episode 8 in a few weeks. From TheWrap: There is apparently a casting search for a young Lando Calrissian who will appear in the Han Solo spinoff movie. From YahooMovies: The original Darth Vader - David Prowse - is not happy. From CBR: From 2016 San Diego Comic-Con comes news that Episode VIII has officially wrapped production. From YahooMovies: What we've learned about Episode VIII and Han Solo at "Star Wars Celebration" London. From ThePlaylist: Rian Johnson talks Episode 8 at the "Star Wars Celebration" in London. From BleedingCool: "Star Wars Rebels" Season 3 expands the universe. From ScreenRant: Episode 8 almost finish production. From VanityFair: Samuel L. Jackson talks about Mace Windu fan theories. From DenofGeek: Mark Hamill hints at his future with Star Wars. From ChicagoTribune: The Lucas Museum of Narrative Art is not happening in Chicago. From ScreenRant: That Star Wars live-action series that never came to be was to be Emperor Palpatine's origin story. From YahooMovies: Candace Payne a.k.a. "Chewbacca Mom" has her own custom made action figure. From iDigitalTimes: Rian Johnson posts a picture of Luke's robe to Instagram. From Collider: After six months, TFA has finished its domestic theatrical run, with a total box office of $936,662,225 million. That's good for #1 all-time (not adjusted for inflation, of course). From YahooNews: "Chewbacca Mom" (Candace Payne) meets the real Chewbacca, actor Peter Mayhew. From YahooNews: 3D-printed replicas of props from "The Force Awakens" to go on sale. From CinemaBlend: A theory about the classic character who may have hurt the narrative of TFA. From DenofGeek: The Academy of Motion Pictures Arts and Sciences (the Oscars people) have released on the web what may be the first trailer for "Return of the Jedi," then known as "Revenge of the Jedi." From HitFix: 39 years ago, Star Wars landed in movie theatres. From YahooTV: Viral star, "Chewbacca Mom" (Candace Payne) joins J.J. Abrams on "The Late, Late Show" with James Corden. From CNBC: This Chewbacca mask is selling out, perhaps because of a viral video. From ScreenRant: Rumors about a confrontation between Luke and Rey against Kylo and the Knights of Ren. From DenOfGeek: Episode 8 will be bigger and darker... according to cast members who are talking. From YahooMovies: Jack O'Connell, one of the young actors interviewed for the role of young Han Solo, frustrated by the audition process. From TheWrap: Young Han Solo is 26-year-old Aiden Ehrenreich ("Hail, Ceasar"). From YahooMovies: Harrison Ford says "wookie cookies" in new Star Wars Lego game. From CinemaBlend: Boba Fett was originally going to have a much larger Star Wars role. From YahooNews: President and Mrs. Obama shake their money-makers for Star Wars Day. From TIME: A history of May the Fourth. From YahooMovies: J.J. Abrams and "Hamilton's" Lin-Manuel Miranda sing "Jabba Flow" for May the Fourth. From YahooMovie: Jeremy Bulloch, the original Boba Fett, has given an interview. From YahooTech: More set photos from Episode VIII - of the Millennium Falcon! From Variety: GLAAD wants an openly gay character in the "Star Wars" film franchise. From TheDailyBeast: Darth Vader is persona non grata at Star Wars event. From ScreenRant: Episode VIII halfway through shooting. From CNET: Director Rian Johnson posts two pics from the set of Episode VIII. From YahooMovies: Daisy Ridley posts some of "Jedi training" for Episode 8 on Facebook. From YahooMovies: In a Blu-ray extra for "The Force Awakens," see Ridley and Boyega in training. From HelloGiggles: George Lucas has a theory that R2-D2 is the narrator of the entire Star Wars saga. From iDigitalTimes: In Episode 8, Luke may be ditching the Jedi robes. From EW: Dave Franco describes auditioning for young Han Solo. From Deadline: Disney's search for an actor to play a young Han Solo may be down to one candidate, Alden Ehrenreich. From: ScreenDaily: J.J. Abrams offers vague stuff on Rey's parents. From HitFix: Obi-Wan wasn't supposed to do... originally. From HitFix: Dinsey breaks ground on Star Wars theme parks. From TheVerge: Mark Hamill was Daisy Ridley's "Yoda" during the filming of Episode 8. From CBR: The Force Awakens was screen for about two dozen terminally ill fans. From YahooNews: Adam Driver reveals why Kylo Ren went to the Dark Side. From EW: J.J. Abrams explain's Kylo's table of ashes. From Esquire: Everything that is known about Episode 8 so far. From YahooNews: Oscar Isaac photo bombs Mark Hamill and Lupita Nyong'o. From BuzzFeed: Star Wars baby names on the rise. From HitFix: Did John Boyega drop a spoiler about Kelly Marie Tran in Episode 8. From CBRSpinoff: In this clip from "The Force Awakens" blu-ray, John Boyega enters the Millennium Falcon for the first time. From BusinessInsider: Here are descriptions of the scenes during Rey's strange vision with a transcription of the dialogue. From YahooMovies: The documentary "Elstree 1976" interviews 10 "unsung heroes" who were there at the beginning of the original "Star Wars." From EntertainmentWeekly: Darth Maul returns in "Star Wars Rebels." From Variety: Harrison Fords says, "Don't do it!" From Facebook: See Maz Kanata Blu-ray bonus clip. From IndieWire: TFA is big at the Jameson Empire Awards. From FTWCulture: Mark Hamill's birthday wishes to John Boyega causes freak-out. From Movieweb: The search for "young Han Solo" is down to a handful of actors. From SlashFilm: John Boyega visits a children's hospital in London in character as Finn. From YahooMovies: Teaser for Blu-ray release reveals first table-read of script. From Esquire: J.J. Abrams says this scene was a mistake. I thought it was odd at the time I saw it, but I didn't think of it as a mistake. From Newsweek: Disney is planning many new Star Wars films - including Obi-Wan and Mace Windu films. From BleedingCool: BB-8 will have his own comic strip, that will fun as a back-up feature in Marvel's Star Wars: Poe Dameron. From TheWrap: Tony Dyson, one of the creators of R2-D2, dies at 68. From CinemaBlend: Daisy Ridley talks filming with Mark Hamill. From YahooMovies: New Han Solo and Maz Kanata details. From Variety: Benecio del Toro and Laura Dern added to the cast of Episode VIII. From USMagazine: The possible first scene of Episode 8 is teased. From YahooMovies: John Boyega wins "Rising Star Award" at the 69th EE British Academy Film Awards. From YahooNews: A Finn-Poe bromance? From FlickeringMyth: Episode VIII begins filming; more Obi-Wan rumors. From BoxOfficeMojo: "The Force Awakens" crosses $900 million domestically, the first film to do so. From Variety: "The Force Awakens" passed $2 billion in total global box office. From CinemaBlend: Yoda almost made a cameo in "The Force Awakens." From TheGuardian: Gwendoline Christie says Capt. Phasma is coming back. From YahooMovies: "The Force Awakens" arrives on Blu-ray April 5th, 2016. From RollingStone: Rock musician/actor Rick Springfield has one of the largest Star Wars action figure collections in the world. From SideshowToys: In case you haven't seen it, here is Adam Driver as Kylo Ren on "Saturday Night Live." From TOH: Daisy Ridley has signed on to executive produce the documentary, "The Eagle Huntress." From YahooMovies: TFA crosses $1 billion internationally. From Polygon: See some of "The Force Awakens" without visual effects. From YahooMovies: The director of Star Wars Episode 9 (Colin Trevorrow) drops hints about Rey's parentage. From CinemaBlend: John Boyega is hitting the gym for Episode VIII. From Variety: "Star Wars: The Force Awakens" sets a few records as it opens in China. From Collider: Controversy ensues when "The Force Awakens" gets a best film nomination. From CinemaBlend: A Poe/Finn romance? From THR: J.J. Abrams responds to critics (kind of) who claim that TFA is a rip-off of the original Star Wars. From YahooMovies: Lucasfilm confirms the identity of the First Order stormtrooper who yelled "Traitor" at Finn. From MoviesdotCom: "The Force Awakens" has passed "Avatar" as the domestic box office champ. From YahooNews: Samuel L. Jackson seems only mildly entertained by TFA. From YahooMovies: It will happen today. "The Force Awakens" earned an estimated $8 million at the box office on Tues., Jan. 5th, giving it a North American haul of $758.2 million. The domestic box office record-holder is Avatar with $760 million. So being behind Avatar by less than $2 million means that TFA should become the record holder today, Wed., Jan. 6th, 2016. From YahooNews: Because of Peter Mayhew's age (71), Lucasfilm had to cast a younger actor to play Chewbacca in more physically demanding scenes. Meet 29-year old basketball player, Joonas Suotamo. From Variety: "The Force Awakens" moves past "Furious 7" and "Marvel's The Avengers." From HitFix: See "The Force Awakens" free this Wednesday, Jan. 6th. From YahooMovies: Rare Instagram photos from Dan Mindel, the cinematographer of "The Force Awakens." From ThePlaylist: More script reveals - a Jedi temple on fire. From Polygon: "Ahch-To" is the name of the planet upon which Rey finds Luke. From YahooMovies: TFA is within a day or so of passing "Avatar" as the highest grossing movie in domestic box office history (not adjusting for inflation). From EntertainmentWeekly: New images of Kanata and Snope. From YahooMovies: TFA sets a New Year's Day box office record with an estimated haul of $34.5 million. That beats the previous record holder, Avatar, which had $25.3 million on a New Year's Day that also happened to fall on a Friday. From CinemaBlend: What Rey saw in her "vision." From Variety: Lucas backpedals on "white slavers" comments. From SlashFilm: See the full Charlie Rose interview with George Lucas that includes "white slavers" and "retro movie" comments. Pete's Dragon is a 2016 fantasy drama and family movie from director David Lowery. 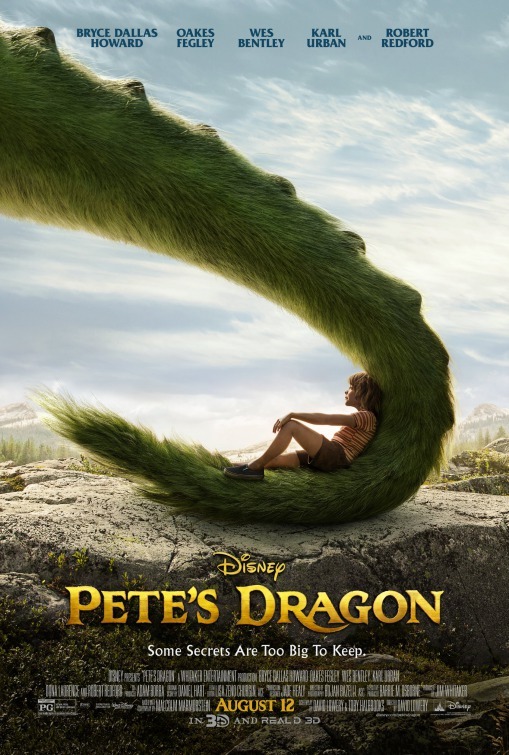 It is a remake of Walt Disney's 1977 live-action/animated musical film, Pete's Dragon. The new Pete's Dragon tells the story of an orphaned boy and his best friend, a dragon, and what happens when the outside world discovers their existence. When he was five, Pete experienced a tragedy that left him an orphan. Lost in the forest, Pete meets a large dragon with green fur, yellow eyes, and wings on its back. Pete names the dragon “Elliot” after a character in his favorite storybook, “Elliot Gets Lost,” and the boy and his dragon become a family. I have only seen bits and pieces of the original 1977 Pete's Dragon, and I was not interested in this new film. I even wondered why Disney needed to remake it. Were there people really clamoring for a fresh take on a film that had probably seen its day come and gone? I received a copy-for-review of the recent Blu-ray/DVD release of the new Pete's Dragon, obligating me to watch it. I was surprised to find that I enjoyed it, although I think that this movie is truly a children's film. In the last few decades, movie studios often believe that they have to make kids' movies have elements that appeal to the parents and adults that bring children to see movies aimed at the little ones. I don't think that Pete's Dragon does that. Pete's Dragon is a tale of child who lives in the world in his own terms. As usual, adults cannot or will not see the magic he (Pete) lives with everyday. It takes another child (Natalie) to truly understand the child hero's point of view. In fact, the adult that is most successful in helping Pete, Grace, turns out to be the one most open to trying to see what the child does by listening and learning from the child. Pete's Dragon is about the kind of magic and the kind of reality or surrealism that children accept, probably because they are willing to believe, where adults might have to suspend disbelief. There is a lot about Pete's Dragon that stretches credulity, and that is OK. If you believe in Pete and also in Elliot, you believe in Pete's Dragon. This is one of those so-called “little movies,” cinematic gems that bide their time, gradually attracting new audiences one viewing at a time. Pete's Dragon isn't perfect, but it is perfect for children and the child in adult viewers. The text is copyright © 2016 Leroy Douresseaux. All Rights Reserved. Contact this site for reprint and syndication rights and fees. The Austin Film Critics Association (AFCA) describes itself as a group dedicated to supporting the best in film, whether at the international, national, or local level. Members of the AFCA contribute to such publications and outlets as Ain’t It Cool News, the Austin American-Statesman, the Austin Chronicle, The Daily Texan, DVDActive, Fandango, Film School Rejects, FirstShowing.net, KOOP Radio, Movies.com, among others. 2016 AFCA Awards were announced Wednesday, December 28,2016 . Founded in 1997, the Online Film Critics Society (OFCS) describes itself as “the largest, most respected organization for critics whose work appears primarily on the Internet.” The OFCS says that it has been the key force in establishing and raising the standards for Internet-based film journalism. Its membership consists of film reviewers, journalists and scholars based in the U.S., Canada, Europe, Latin America and the Asia/Pacific Rim region. The Online Film Critics Society currently consists of 254 members with writers representing 22 countries across the globe. The 20th Online Film Critics Society Award nominations were announced on Tuesday, December 27, 2016. The North Carolina Film Critics Association (NCFCA) was formed by Kenneth R. Morefield in 2012 to promote film journalism in North Carolina. It is comprised of film journalists who either live in North Carolina or write for outlets that serve readers in this state. The NCFCA votes annually on awards for achievements in film. The winners of the 5th NCFCA Awards will be announced at the NCFCA site on Monday, January 2, 2017. The nominees were announced Tuesday, December 27, 2016. The Grammy Awards (or Grammys) are given out by the National Academy of Recording Arts and Sciences (NARAS) of the United States. The Grammy is an accolade that recognizes outstanding achievement in the music industry. It is the music industry equivalent to the Academy Awards for film, the Emmy Awards for television, and the Tony Award for stage. The nominees for The 59th Annual GRAMMY Awards were announced Tuesday, December 6, 2016. The 59th Annual Grammy Awards recognize the best musical (and some spoken word and video) recordings, compositions, and artists for the eligibility year that began on October 1, 2015 and ended on September 30, 2016 in a total of 84 categories. The 59th Annual GRAMMY Awards will be held on Monday, February 12, 2017, at Staples Center in Los Angeles. The ceremony will be broadcast live in high-definition TV and 5.1 surround sound on CBS from 8 – 11:30 p.m. (ET/PT). Listen - Tim Bowman Jr.